The last concert was a treat for all of our ears and eyes! 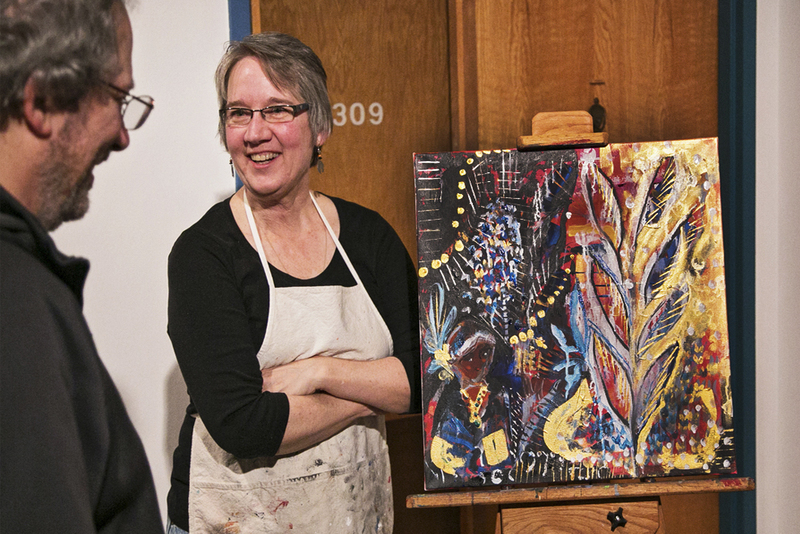 A firework of pianistic mastery and true artistry paired with live painting by Jamie Kalvestran. While our good friend Clarice Assad has returned to her New York City domicile, she truly made an impact during her two month stay in the Twin Cities. If you are curious what she´s been up to, view this amazing video. It documents her work with girls at a St. Paul Public school in March. For our NEXT CONCERT ON APRIL 8, we are excited to welcome guitarist Andres Prado (Lima/Peru) who will be passing through the Midwest. Andrés Prado studied at the National Conservatory of Music (Lima), The Avellaneda School of Popular Music (Buenos Aires) and Trinity College of Music (London), specializing in Jazz and Latin American Guitar. As a composer his work has been recognized and documented for the national archive in Perú. As a player he has led his own bands in numerous appearances at music festivals in Perú, Argentina and England, on radio and television. Listen to Andrés Prado HERE. Celebrating our brand-new piano that night will be Ted Godbout, a young Minneapolis-based musician who has earned degrees in both classical and jazz piano performance. Another big shout out to WELLS PIANOS of St. Paul for their generous loan in support of our little series! Back by popular demand, and turning this night into a rare moment in Lowertown Classics history is Randy Sabien, jazz violinist, composer, and music educator known for his live performances and numerous recordings, many of them on Flying Fish Records and Red House Records. At the age of 21 he founded and chaired the Jazz Strings department at Boston's Berklee College of Music and since 2009 has been the chair of the Strings department of McNally Smith College of Music. With complementary wine tasting generously served by Revival Wine, Beer and Spirit. Music, Art, Wine and Candy. CDs of the artists for sale. The next Lowertown Classics is near, and we´re preparing for a night of exceptional music - by Bach, Rodrigo and Jazz standards as well as originals by Jennifer Parker. Chansons by 16th Century French composers, polyphonic folk music from the Balkans and the Republic of Georgia. And drinking songs from Britain. The Lowertown Lofts Artist Cooperative is proud to welcome these amazing local and international performers, we are also happy to have Lowertown Lofts Artist Joe Krumpelmann's stained glass pieces featured on that night. LLC Member and Eva Beneke just returned from her trip to Las Vegas. She taught as a guest clinician at Las Vegas Arts Academy for 3 days, where she worked with kids from age 13 to 17. LVA is a 12-time Grammy-winning institution that has produced many current young talents. Her visit culminated in a student concert, where the Junior and Senior students performed a concert of ensemble music, with Eva as a soloist. Here´s some video from the performance. - our own Eva Beneke, classical guitar! Concert starts around 8:15pm, come early to grab a seat. Tell your friends about Lowertown Classics! Wilhelmshaven is a new video by Dir. Tom Schroeder made to the music of Waschering Maschine, the experimental band of LLC member Billy Franklin. 8 rounds of musical engagement with Waschering Maschine. Ghent, Belgium plays Wilhelmshaven, Germany. With Brian Judd as Gregory Peck. Please accept the invitation to step OUT with Waschering Maschine. Learn more about Eva's 10 day tour in China here! For Eva's full schedule in Germany, Switzerland, Luxembourg,China and the USA please visit this site.